Village Hair Mask is produced by the Russian cosmetic brand Organic Beauty Farm. The product is based on traditional beauty recipes and formulated with 100% natural goat milk. It is designed to strengthen the hair and to stimulate its growth. The mask is infused with burdock oil, wormwood extract, organic marshmallow root extract, horse-heal extract, and hops extract. Free of GMO, parabens and formaldehyde. 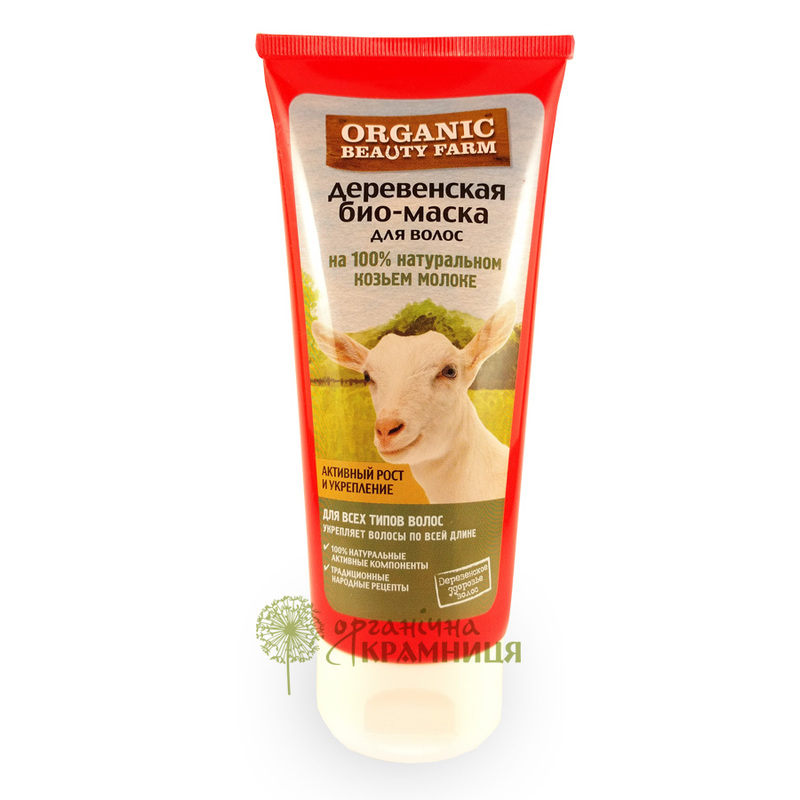 Natural goat milk contained in this bio mask is supplied by the Bulgakov farm (formerly known as the Sukhanov farm) located in Dmitrov Raion of Moscow Oblast. The farm is situated in a clean area with no industrial enterprises in the vicinity. Animals here live in a natural environment and eat organic feed. This allows the Bulgakov farm to produce high-quality and nutritious goat milk. Organic Beauty Farm's hair mask is infused with medicinal herb extracts. Wormwood extract has a soothing and healing effect on the scalp. It restores the natural strength of your hair and stimulates its growth. Horse-heal root extract is rich in inulin, a naturally occurring polysaccharide. It has a rejuvenating, softening and moisturising effect. Horse-heal extract strengthens the hair and makes combing easier. Village Hair Mask also contains burdock oil which has been used as a hair care product by Russian women for centuries. It helps to prevent hair loss, keeps the scalp hydrated, prevents brittle hair and split ends. Burdock oil also strengthens weak and damaged hair and stimulates hair growth. Directions. Apply onto clean, wet hair. Spread along the entire length. Leave for 10-15 minutes. Rinse thoroughly. Ingredients. Aqua with infusion of Caprae Lac, Arctium Lappa Root Extract, Artemisia Vulgaris Extract, Althaea Officinalis Root Extract*, Inula Helenium Extract, Humulus Lupulus Flower Extract; Cetearyl Alcohol, Behentrimonium Chloride, Cetrimonium Chloride, Glyceryl Steareate, Cyclopentasiloxane, Tocopheryl Acetate, Lauryl Clucoside, Guar Hydroxypropyltrimonium Chloride, Parfum, Citric Acid, Kathon, CI 19140, Caramel. Want to buy Village Hair Mask? Call us or submit your order via our web site! Organic Beauty Farm is a cosmetic line comprising products based on traditional rural beauty recipes and natural farm products from Central Russia. It is produced by the well-known Russian company Pervoe Reshenie (First Solution) known for its wide range of natural and organic cosmetic brands, such as Granny Agafia’s Recipes, Planeta Organica, Organic Therapy, Organic People, Kinder, etc. Having started as a distributor, Pervoe Reshenie soon shifted focus to manufacturing its own products. The company launched is first brand, Granny Agafia’s Recipes, in 2002. It still is one of the company’s most recognizable brands which has spawned several “spin-offs” including Agafia’s Herbs, Agafia’s Bath, White Agafia, Five Juices, and others. Organic Beauty Farm cosmetics are formulated with natural products supplied by Russia’s finest farms located in clean areas with no plants, factories and other sources of pollution in the vicinity. These products include moose (elk) milk, whey, beeswax, honey, and egg protein. Additionally, cosmetics branded as Organic Beauty Farm are enriched with plant ingredients such as wheat germ oil, burdock oil, mallow extract, cranberry seed oil, birch bud extract, etc. Organic Beauty Farm products are free of parabens, GMO and formaldehyde. Neither ingredients nor finished products are tested on animals. All products are packaged in convenient tubes or bottles. They are noted for their attractive design and affordable price. The cosmetic line comprises shampoos, hair conditioners, body scrubs, body creams, shower gels, liquid soaps, and bath foams.